'Rapid Review' AIIMS November, 2011: Thanks for the Support! We wish to thank the authors of 'Rapid Review' AIIMS November, 2011, for painstakingly preparing a good book and all the readers for lending their support. Happy to announce, 'Rapid Review' AIIMS November, 2011 has been declared the #1 BESTSELLER across book stores. We also take this opportunity to inform our readers that 'Rapid Review' is the only book which has all 200 MCQ's compiled without repeating any MCQ. After the success of AIPGMEE supplement, EduLanche Publishers is about to launch Rapid Review, AIIMS November 2011. Scheduled date of release is 7 Dec, 2011. Book to be available at medical book stores and via edulanche.com/buy. AIPGMEE, 2011 Launched in Q.BANK! The wait is over! EduLanche Q.BANK which makes learning and revising MCQ's quicker, easier and more interesting is now officially open. 'AIPGMEE 2011 Classroom' with 18 Subject wise Quizzes and a 300 MCQ Quiz launched to Subscribers! Thanks for the suggestions which have helped to shape up the Q.BANK. Cheers! The response to the promotions of EDULANCHE MOCK EXAMS has been inspiring. Here is a Quick, Image tour of the EduLanche Quiz portal! EduLanche Med Prep is an innovative platform for medical students to practise MCQ's online. The Q.Bank has more than 9000 MCQ's from various Medical entrance exams and fresh set of questions added by our expert medical faculty. 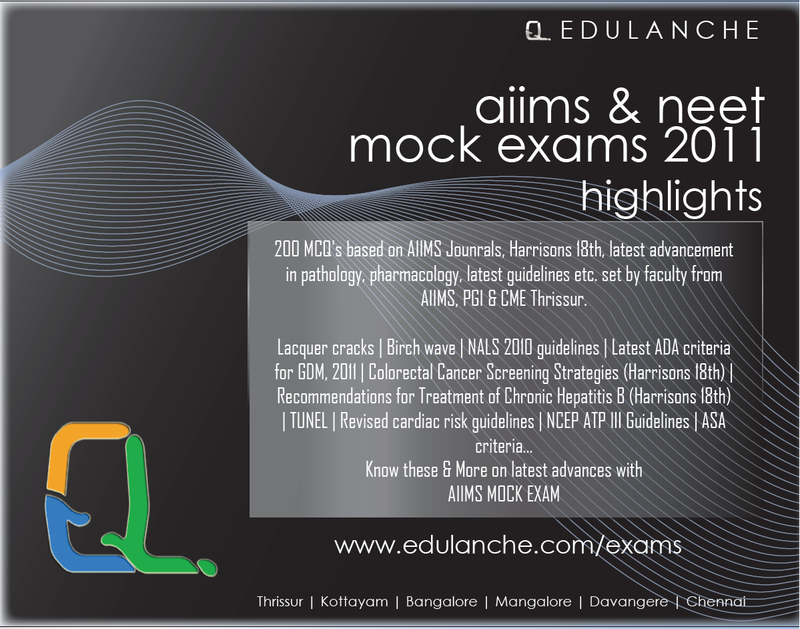 With more students using online resources, the convenience offered by EduLanche Med Prep in the form of monthly NEET 2012 mock exams will be unmatched. Subscriptions will be open one week before the first mock exam. More updates and promotions to follow.